Fricassee Chicken is a traditional Jamaican dish that has roots in Africa and Europe. It is a favourite by Jamaicans because of the “gravy”. 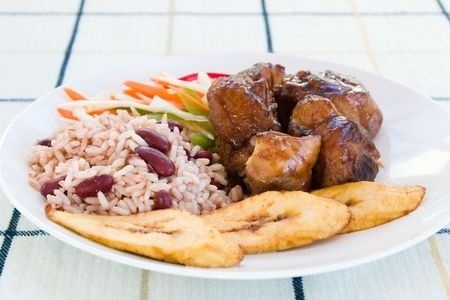 It is also called Brown Stew Chicken. Clean chicken, wash whole in lime water if desired. Cut into serving pieces, season to taste. Remove seasoning from serving pieces, fry pieces of chicken in shallow fat until golden brown, but not burnt. Pour off excess fat leaving small quantity in frying pan or Dutch pot. Place browned pieces in pan or Dutch pot. Add seasoning and small quantity of water. Cover and cook slowly until chicken is tender, but not overdone.